My years spent as an elementary teacher usually colors the way I see most holidays. In the classroom, my favorite thing to do was to say "Let me tell you something that the other teachers won't tell you..." It made the students pay attention, and made them feel that they were in on a secret: the secret truth that is history. 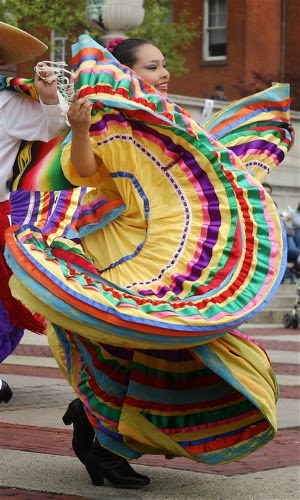 I love bringing light to things that I find interesting... Cinco de Mayo is one of them. My post can be a little deeper, if you are seeking history. But what I am about to tell you is how this holiday has affected my heart, and how awkward it was to grow up Hispanic in a farming town in the 70's and 80's. It starts with my my childhood in Tracy, California. I grew up with a Mexican-American mother, Juana, who had her name "American-ized" to Jennie as a small girl. I never sensed any conflict in this, and there was never a discussion of when it happened. My father was of Irish descent, and came from Boston - his name is Jack. So, Jack and Jennie had five stunning little kids, all delightfully beautiful - not "too white". I was not Irish only, but I had the Irish pride. I was not Mexican only, but I had the Mexican coloring. No one told me that if I ever left American soil and moved to Africa, I would be known as "the American" and no one would ask about my ethnic heritage. In high school, a few days before the Cinco de Mayo parade in town (if you've never been to one, you are missing a true slice of Americana) I found out in the Tracy Press that Melissa, my sister Shari's friend, had been voted Cinco de Mayo queen - the queen of the parade that would be held in town. She’d get to ride on a convertible surrounded by color and flowers. I was livid...what a faker! She was like me, pretty damn white; not a "real" Hispanic. What right did she have to call herself a Cinco de Mayo queen? Now she would be paraded in front of the whole town and worshiped, along with our Lady of Guadalupe, like she was a real Mexican girl. I threw the paper down, angered by the irony. As I got ready for school, I questioned my own schizophrenic reaction. Why did I care about a stupid Mexican parade anyway? It was then I realized that part of me felt orphaned. Deep down inside, I was the faker. I had an Irish surname, that identified me as a proud Irish girl; I also had brown eyes and a perpetual tan that was the envy of my friends. How much did I celebrate my own Mexican-American heritage? In the carpool on the way home, Melissa's reign was the subject of conversation. "Did you see that Melissa is going to be Cinco de Mayo Queen?" one of my friends said. "She definitely was the prettiest one of all the girls who were running." Everyone agreed, and said even her picture in the paper was gorgeous. Cinco de Mayo queens are not known for making speeches, just looking good. "Hey, Janet," one of my other friends said, "Why didn't you run for Cinco de Mayo queen?" He meant it as a compliment, really. He didn't know how much the whole thing bothered me. "I don't have enough Cinco in my Mayo." I replied flatly. Everyone thought that was funny, even my mom laughed. The thing that bothered me was that I didn't know how to do it - be a Mexican-American. After all, Cinco de Mayo, while celebrated in Puebla like a bomb, is not such a popular holiday in the rest of Mexico. In the States, it had turned into a Hispanic Pride Day where all of the real cowboys of California got out their black suits and big sombreros and rode atop horses carrying Mexican flags. It was when the pretty Mexican girls dressed up in big skirts and made hypnotic circles with them while they danced. That one day was the day for Hispanic pride; all the other days of the year didn’t seem so nice for the Mexican kids, so I never admitted to being one of them. After all, many of them were poor and got free lunches because their parents were working the fields. Many spoke Spanish before they spoke English and drove low riders or shiny big cars that had air horns. I could count my real Mexican friends on one hand, and my personal hypocrisy was starting to wear on me. In reality, I got in touch with my Mexican heritage in the kitchen. La cocina is where every Hispanic woman becomes a real Mexican. It started in high school when I worked out my half-Hispanic chica that lay dormant in me. I learned the secrets of a good enchilada sauce from my grandma. I made masa with her and rolled tortillas next to her; mine came out "like maps" my grandma said. Eventually, after the challenge of the teen years, I became less shallow, and less consumed with myself. I began to read quite a bit and what I found out that the history of Cinco de Mayo helped me. After all, the holiday had to be about more than how to make the perfect margarita, right? As a Californian, I can honestly say that I never struggled to learn how to celebrate and drink margaritas... that came naturally. I have struggled to be a good representation to the Mexican-American side of my family who have gone before me and given me their love and hearts and their faith. I still seek out the truth, strength, and beauty of my people, who are generally underestimated, still. In my kitchen, I am Mexican. In South Africa, where I was known as a white American lady, I cooked tamales with a killer sauce that made me cry and miss my family. It was then I knew I carried a lot of them with me. Let me tell you something that the other teachers won't tell you..." It made the students pay attention, and made them feel that they were in on a secret: the secret truth that is history. – here’s the REAL STORY!! In 1862, Mexico was huge, but the army was not as advanced in Military strategy as the Europeans who had interests there - France, Spain and Great Britain. The three countries, decided to unite and force an uppity Mexico to pay back the money it owed to them, its foreign investors. By the end of the year, Spanish ships from Cuba sat at Veracruz, Mexico's largest port, joined soon after by ships from France and Britain, in a not-so-subtle threat to Mexican sovereignty. After several skirmishes with the French, on May 5 in Puebla, a large city between Mexico City and Veracruz, that the French officially underestimated the spirit and the power of the Mexican army and were defeated, badly. The Battle of Puebla, while a great show of strength, didn't end the war. It took a lot of other battles, and slowly the world took notice that Mexico was more than what they thought it was. President Johnson, in order to protect American interests, sent the US Army to the border to show our official support, and in 1866 the French withdrawl (not exactly an official surrender) spoke volumes to the world. Mexcio was un-officially sovereign. News of the Mexican victory spread to the western US when Mexican gold miners in northern California were so overjoyed at their compatriots’ success that they celebrated by firing guns and singing patriotic songs. Thus, Cinco de Mayo, the party, was born.